Empowering individuals and arming the helpless with a voice to air issues of political, social, and economic concern is the essence of effecting positive change in our world. Journalists for Human Rights endeavours to provide bright individuals with the tools and skills to be storytellers in their native countries. Objectivity can be a luxury in countries abroad that suffer from religious, political, or civil strife. JHR helps eradicate the monopolization of all media channels that are dominated by oppressive forces. In training over 12,000 journalists, JHR has been pivotal in the creation of leaders such as keynote speakers Amara Bangura and Yeama Thompson; they have become agents of positive change in many communities abroad. JHR is a guiding light that helps journalists shine a spotlight on otherwise “invisible issues” that concern the well being and livelihood of those who reside outside of ‘first world’ nations. For instance, the organization and its advocates have exposed corruption in Liberia, exercised fair and balanced elections in Sierra Leone, uncovered sexual slavery and exploitation in Ghana, and combated oppression and dangers in the Congo. 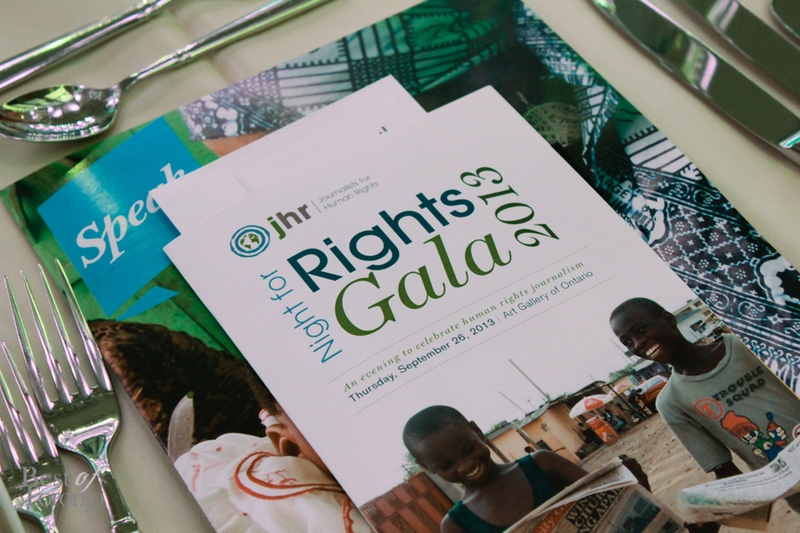 In light of the ever-growing successes JHR has achieved so far, a special gala was held in the Art Gallery of Ontario’s Baille Court to honour a number of individuals. While we savoured a delectable three course meal prepared by Chef Annick de Goaix and were guided through the night’s presentations by Master of Ceremonies, Dawna Friessen (Global News Anchor and Executive Editor), we listened to two veteran JHR Alumnus reflect on their careers thus far and how this organization has helped to propel their successes in the journalist trenches. While their words weighed heavy on the hearts and minds of all the guests, they expressed overall sentiments of hope and determination. Amara Bangura candidly recounted his experiences in collaborating with BBC Media Action in Sierra Leone and winning an award for his story on neglected mental health cases. Yeama Thompson shared her story about the sexism she encountered in the newsroom, then subsequently combatted to rise through the ranks and become Editor of The Chronicle newspaper in war-torn Sierra Leone. As the evening drew to a close, Rachel Pulfer (Executive Director, Journalists for Human Rights) eloquently summarized it best: we have the right to high expectations of our community, of authority, and most importantly, of ourselves. So long as there are countries out there whose media is endemically compromised, equitable and unbiased reporting is a cause we need to support and fight for. This issue is infinitely bigger than any one of us. In knowing this, we can wield the strength to effect positive change in the world.